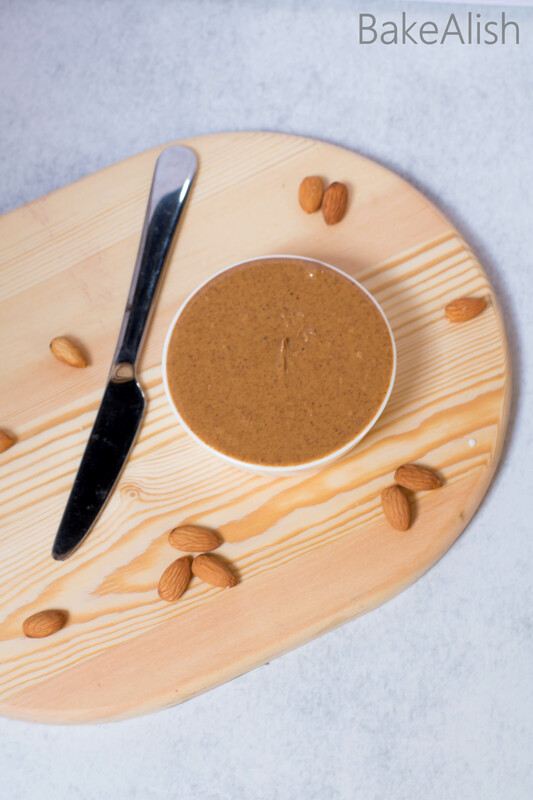 This Classic Homemade Almond Butter is creamy, yummy and delicious. 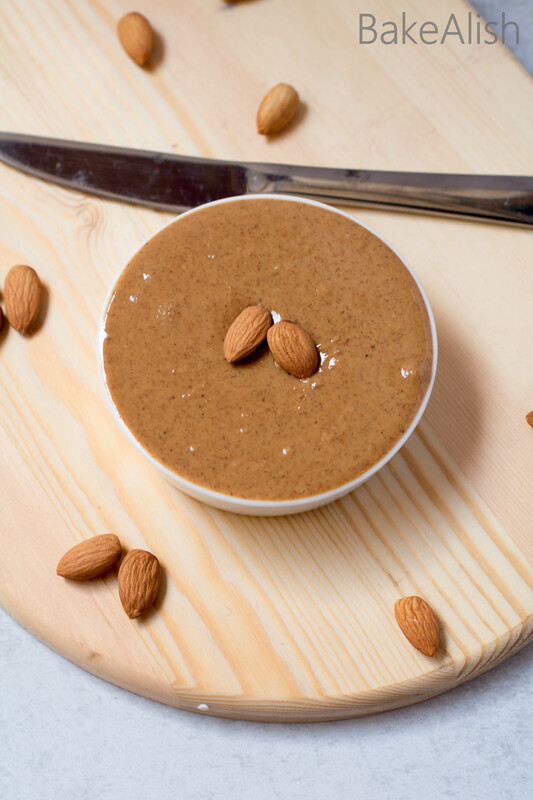 It’s easy to make and you may not want to buy readymade almond butter after trying this one. No fancy ingredients but just a simple method can help you make this creamy spread. To top it all it is extremely healthy and good for you. I love the richness this butter delivers. Moreover, it’s so healthy that I have all the reasons to spread it onto a slice of bread and bite into whenever I want to. 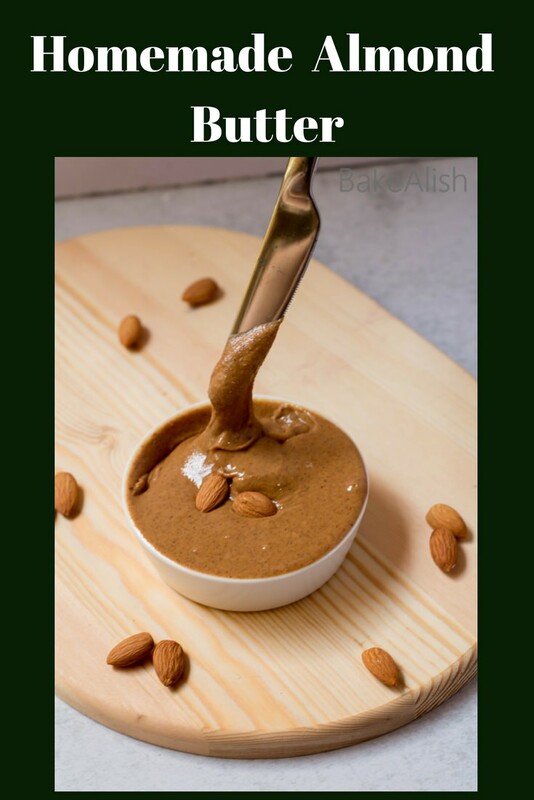 This Almond butter is easy to make and is something that you can use in so many recipes. Use it as a spread or even a dip. I’ve even used it in many baking recipes. This week has been a chocolate rush. Posted two lovely chocolate recipes and received great feedback for both recipes. Todays Homemade Almond Butter recipe is going to come in great use for my next recipe coming up tomorrow. So stay tuned for more fun with baking. Almonds: It is the star ingredients for this one so you want to make sure you use the best. I’ve come across a lot of almonds which have a weird whiff when you bite into it. That’s because they are really old or unkempt or just cheap quality. In our recipe almonds are going to be ground in a food processor. To do so you need to make sure the oils released from the nuts don’t smell due to constant grinding in the food processor. Make sure to use good quality almonds that are not old and do not have a dark outer skin. Honey: While making Almond Butter we also add some honey to it which adds a tinge of sweetness. You can skip this one if you’d like to, however, I think it helps in balancing flavors. It is the first step to making Homemade Almond Butter. Roasting the almonds helps to release their natural oil. To do so you need to place the almonds on a baking tray lined with parchment paper. Make sure you spread the almonds all around the tray evenly. In a preheated oven roast the almonds for 10-15 mins at 160 degrees C.
Toss the almonds every 5 mins while baking. Once done remove the almonds from the oven and let it cool a bit. The almonds need to be warm while churning in the food processor, not hot. You can even roast the almonds on the gas in a pan. To do so take a dry pan and place it on the gas. Switch on the gas making sure it is on medium heat. Toss the almonds every minute. Roast for 10-15 mins until it gets a bit darker and crunchy. Once done let it cool a bit and then churn when warm, not hot. 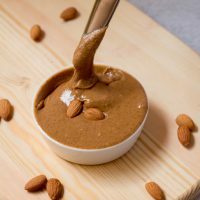 This Classic Homemade Almond Butter Recipe is creamy, yummy and delicious. 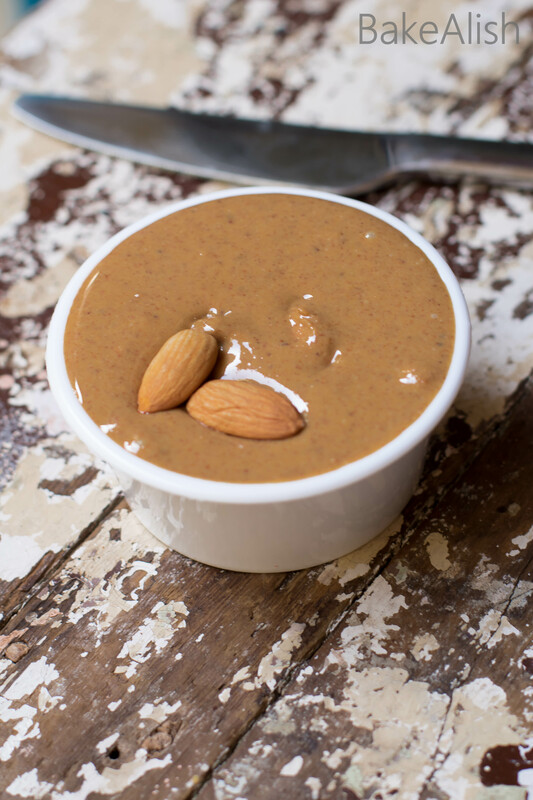 It’s easy to make and you may not want to buy readymade almond butter after trying this one. No ingredients but just a simple method can help you make this creamy spread. To top it all it is extremely healthy and good for you. Place the almonds on a baking tray lined with parchment paper. Roast them in a preheated oven for 10-15 mins at 160 degrees C. Once done let it cool a bit. You want the almonds to be warm while churning and not hot. Once warm and not hot transfer the almonds to a food processor and process for 30 seconds. You will see that the almonds form a powder. At this stage at the honey and salt. Switch on the processor and keep processing till you get a creamy texture like butter. You must stop the mixer every minute or two and scrape down the sides of the mixer. This even gives a break to the food processor and makes sure it does not heat up. It should take about 10 mins till you find the consistency of the mixture creamy. Once done, store the almond butter in a container and refrigerate. It is essential that you refrigerate the mixture once made. You can refrigerate it for about a month and use as required.